The French will put the systems on it, they just won't give the NATO coding and production license. We are arguing about it because we want the technology but the French know we are just going to copy it when the C&C functions would be worthless without upgrading our whole network. The Russian Navy already has a working C4I system called Sigma or something that combines the sensor picture created by sonar, radar etc so that targets can be tracked in the air, on the sea, and under the sea and that picture can be shared between other vessels using the same system and these targets handled collectively. The NATO system offers more of the same but NATO standard, which is different, but not necessarily better. The Russians want the full system because they are paying the full system price, and they want these helicopter carriers to be more than just helicopter carriers. It is not an accident that the first two that will be made in France will be deployed as far away from France as is possible for a Russian ship. The potential two vessels the Russians will build will likely be based in the northern fleet, so I would expect they might prefer some interoperability with NATO systems for such a vessel. worthless without upgrading our whole network. Except that so far only small vessels like Corvettes have actually been the only newbuilds so far. It would not be much of a big deal to get the licence to use this new NATO system and "adapt" the useful bits of it and develop a system to put in all your ships Frigate sized or bigger. St. Petersburg's Severnaya Verf shipyard on Thursday started construction of a new corvette for the Russian Navy. The project 20385 corvette is a larger and improved version of the Steregushchy class corvette. It uses stealth technology to reduce the ship's secondary radar field, as well as its acoustic, infrared, magnetic and visual signatures. "It is a fundamentally new ship for the Russian Navy; its performance and combat power surpass other ships of the same class," Severnaya Verf said in a statement. Severnaya Verf is currently fulfilling 75 percent of state orders for the construction of warships for all four Russian fleets. The shipyard has four Steregushchy class corvettes, two Admiral Gorshkov class frigates and a Project 18280 intelligence ship. Severnaya Verf is also fulfilling orders to upgrade four Koni class frigates for the Algerian navy. So they get a bigger and stealthier version of a vessel they like... that has to be better right? I need more information before I can say it is a good decision. Project 20385 is a heavily modified version of Project 20380. As the name suggests, the modifications begin with the 5th hull (it actually Projects 2038.0 and 2038.5, but the current nomenclature doesn't accept dots which were used in Soviet industry). - Project 20380 (Stereguschy) - 1x Kashtan-M AD on the bow, 8 x Uran ASM and 8x Paket-NK torpedoes amidships. - Project 20381 (Soobrazitelny, Boiky, Sovershenny, Stoiky) - 12 x Redut AD on the bow, 8 x Uran ASM and 8x Paket-NK torpedoes amidships. - Project 20385 (Provorny et al.) - 8 x UKSK ASM on the bow, 8x Paket-NK torpedoes amidships, 16 x Redut AD on the stern. So what we are talking about here is a vessel that is armed with a 100mm main gun with two 30mm gatlings and 8 Manpads, backed up with 16 x 40-120km range SAMs, plus 8 anti torpedo torpedos (PAKET-NK is an anti torpedo weapon), and a primary weapon system of 8 mix and match weapons that can be land attack (Klub subsonic, Brahmos supersonic, Kh-101/102 conventional/nuclear cruise missile) Anti ship (Klub subsonic and supersonic, Brahmos/Yakhont/Oniks supersonic) and anti sub (Klub 40km range with a torpedo payload)... or any combination of those options in the 8 tubes. The real question is are these Redut launchers full size S-400 missile tubes and if they are does that mean they can take the full sized long range missiles? Also... more importantly does that mean that each tube can hold 4 of the smaller S-400 missiles with the 40km and 120km ranges. If it does then a mix of 250km range full sized missiles with the smaller 40km and 120km range missiles will make it quite a useful vessel. With 16 full sized tubes you could go for 64 missiles with 32 of the slightly larger of the small missile types and a range of 120km and 32 of the smallest missile type with a range of 40km which would be plenty most of the time... in terms of numbers and range. When operating with larger forces it might reduce the loads to 24 each of the smaller missiles to allow the carriage of 4 of the larger missiles either for 250km range targets for the standard missile or 400km for the long range model when it becomes available. Obviously most of the time such a small ship would have no need for such long range missiles but with the Sigma battle management system fitted it will share battle information with other platforms and space assets and could be used to attack a target from an unexpected direction using long range cruise missiles or SAMs. GarryB wrote: The real question is are these Redut launchers full size S-400 missile tubes and if they are does that mean they can take the full sized long range missiles? I dont think the USUK launchers on these ships can carry the big missile of S-400 , they will only carry the 40 km 9M96E and 120 9M96E1. From what I understand the single tube can carry single 9M96E1 or two 9M96E , I will confirm on that. There are two vertical launch systems on the ship, one is the USUK launcher for Brahmos and Club etc... in other words anti ship, anti sub and land attack cruise missiles with 8 tubes per system. 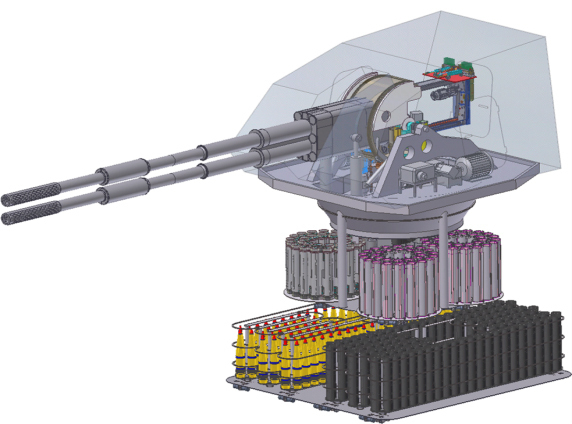 The air defence VLS is the Redut launcher with 16 tubes. AFAIK they are standard systems so bigger ships wont have different launchers... they will just have more launchers... so a corvette might have one USUK launcher with 8 tubes, while a modified Kirov might have 50 USUK launchers with 400 missiles. I do think you are right that loading 400km range missiles into this sort of ship would be very strange, but it should be possible, though in practise unlikely. I also remembered a conversation I had with someone about how as their boats get stealthy they need to add stealthy weapons and sensors and that Kashtan would have to change. I remember talk of how it will be replaced with Duet, which is the stealthy twin 30mm gatling turrets (one gatling gun above the other in one turret) plus the Redut vertical launch system loaded with 9M100 missiles. This would make it very similar to a Sea Ram/ASRAAM type missile with vertical launch enabling it to hit targets from any direction without the need to turn the launcher to the appropriate direction. The other thought it that the Vityaz is based on the standard S-300 sized missile tubes and combines the small missiles of the S-400 (ie the 120km range and 40km range missiles)(4 missiles per tube) and can also launch the 9M100 missile (4 missiles per tube), or can use larger missiles like the large S-400 with the 400km range. Obviously the launcher is generic and will be fitted to all Russian vessels so it can fire the entire range of missiles, but in this case it is on an enlarged corvette so it will most likely carry a few 120km range S-400 missiles, and 32 9M100s (equal to one Kashtans worth of missiles) and the rest will be the 40km range S-400 missiles. This is the equivelent of a Frigate or destroyers armament in that the 120km range S-400 missiles is the equivelent of the SA-N-6 missiles carried by cruisers like Kirov and Slava, plus the equivelent of the SA-N-7 missiles carried by Destroyers like Sovremmeny class vessels, and still retaining Kashtan level armament for close in protection. Any pictures of the real thing to confirm whether it has standard AK-630 turrets or Duet turrets? I believe the Duet turrets carry rather more ready to use ammo. Note the fact that this Corvette is tied into the Sigma system means long range weapons would be quite useful on certain missions. Most of the time a corvette is for coastal patrol and similar duties, but with a 100mm gun it could be used for artillery support of a landing or in a larger conflict it could be used for a range of duties. The Sigma system is like AEGIS and combines the air, sea surface, and subsurface picture and then shares that information with other ships equipped with Sigma. This means the captain of this Corvette will be seeing the same air/sea/submarine picture the captain of a carrier would be seeing. Using up two tubes in the USUK launcher for Kh-101 5,000km range cruise missiles and two tubes in the Redut launcher for 400km range SAMs could result in quite a surprise. Make the best use of what you have... Russia will have a lot more Corvettes than carriers, so by tieing them into the net they get more value if they have a choice of weapons. Do you have any information on Sigma C3 system. You are right in that USUK and Redut are different launchers , I asked some one how many missile Redut can carry and it was 4 missile per tube , so I am assuming 4 9M96E and 2 long range 9M96E1. Since this is a corvette i would say even the 40 Km 9M96E is an over kill , I will not expect it to have 120 km missile , perhaps the 40 Km plus VLS 9M100. Corvettes are generally ASW ships with some self defence capability , this ship has the displacement of Corvette but fire power of a top notch frigate. It seems information on Redut system is classified so we need to wait this Gorshkov is launched. On Vityaz it has the 9M96E and 9M96E1 short/medium range missile with AESA radar , i really need to confirm on the VLS 9m100 missile which has RVV-MD and RVV-SD as its short range missile. Think about the S-300 system that has 4 big tubes on each truck. Each one of those tubes is the size of the tube of the Redut system, so the vertical launch Redut AD system on this boat has 16 tubes so it is the equivalent of 4 trucks (ie 16 tubes in total). The thing is that the Redut AD vertical launch system will be used by all vessels in the Russian navy from corvette right up to Kirov and perhaps carrier, so they are all the same design. That makes the system standardised. In actual practise however the Kirov is going to have a much more powerful air search radar than any corvette so it will be able to use the 400km range S-400 missiles to best effect. It might even have X band radars to see into space to guide S-500 missiles when they become available to hit ballistic missiles and aerial targets at 600km. But to get the benefit of standardisation the launcher fitted to the smallest corvette has to be the same as the launcher fitted to the largest and most capable vessel in the fleet. It means parts and training commonality and it means that some companies that make all the different launchers can either focus on one type of launcher or make something else that the navy needs. Looking at the new S-400 missiles... specifically the 120km and 40km range missiles when mounted on the trailer for the S-400 they use much narrower tubes so 4 missiles can be fitted into one of the larger full sized tubes. It will be the same for the naval system. With a single vertical launch system unit with 16 tubes that means you can fit 4 missiles in each tube of the 120km or the 40km missiles. Their launch tubes are the same width, the 120km range missile is just longer than the 40km range missile so if you can get 4 40km range missiles in one tube then you can get 4 120km range missiles in one tube too. The standard launch system means if you can use all the missile types then you make the platform much more versatile and can load the weapons mix based on the mission. With the Sigma system installed it is comparable to a Yak-130 trainer operating with an AWACs... you can put 400km range R-37M AAM missiles on the Yak-130 trainer because although the Yak can't detect targets that far away the AWACS can and it can provide the Yak with all the data it needs to launch the R-37M at a target 300km away with as good a chance of a kill as if it had been fired by a Flanker or Foxhound. The point is that most of its time will be spent doing patrol stuff, in which case 40km range missiles will be good enough. When the 9M100 missile becomes available then a normal armament might consist of 32 x Morfei missiles for close in protection and 32 40km range missiles for self defence. If the corvette is operating as part of a screen for a battlegroup however having 120km and even full sized 250km range missiles might become useful, because when the enemy launches 15-20 Harpoons at your little corvette... 20 years ago that was one lost corvette, but with this corvette the battle group will have Ka-31s that can scan down to sea level and see incoming missiles and pass that data to all vessels with Sigma. This means that this little corvette armed with 4 full sized standard S-400 missiles with a range of 250km, which leaves 12 tubes, with 4 missiles per tube which means 48 missile positions left for, say 12 120km range missiles, 18 40km range missiles and 18 Morfei short range missiles. These missiles are active radar homing except for the Morfei which uses IIR seeker technology. All are fire and forget... and that does not even take into account the 100mm an 30mm guns and Iglas... the Igla-S is perfectly capable of taking down a Harpoon with the right cueing... the addition of a proximity fuse on the Igla-S was specifically to make it capable of taking down cruise missiles. I totally agree, the 40km range missiles will protect the ship from helicopters which are a serious modern threat to small vessels. The 120km range missiles would be useful to protect from a variety of fixed wing aircraft armed with air launched anti ship missiles like Exocet. However the ability of the system to carry all the missile types saves money because there is only one SAM launcher that can launch all SAM types except Kashtan and SOSNA in the future Russian navy. Kashtan and the Sosna missile in the cheaper Palma mount will likely be fitted to smaller vessels where stealth is not really an issue. It also adds flexibility in that in the future with air support from the carrier a corvette can carry the same long range weapons their heaviest battle cruiser can carry... it just carries them in smaller numbers. The development of universal cruise missile launchers (USUK) and universal SAM launchers (Redut AD) means all their ships from the smallest to the largest will be much more flexible and much less tied to a specific role. It means instead of making X number of ASW boats and X number of torpedo boats and X number of fast attack craft with anti ship missiles, they can make X + X + X number of corvettes and arm them for each mission as needed. The greater production runs of one type will improve commonality and reduce costs reduce training issues and lead to a much more efficient navy... especially as this model is repeated with larger vessels, with the larger vessels having larger sensors and more powerful propulsion and larger numbers of the same standard weapon launchers. No, the RVV-MD is the updated digital R-73... perhaps called R-74M but looks externally like an R-73 but with a better seeker and greatly improved electronics, while the RVV-SD is the same update for the R-77 with improved sensor, digital electronics and improved flight forming algorithms to extend range from 80km ideal shot against low manouvering target (ie AWACS or troop transport) to 110km against the same target in the same ideal circumstances... high altitude high speed launch on a closing large RCS low manouverable target. The 9M100 is supposed to be the new replacement for the RVV-MD short range IR guided AAM and is supposed to be the Russian equivelent of the ASRAAM with lock on after launch IIR seeker with onboard 3D database of target types so it can recognise its target and select the right one based on information via a datalink from the launch platform. It is supposed to be launched from the weapons bay of the PAK-FA in the direction of the target and scan and acquire its target in flight after launch because from inside the weapons bay it can't get a lock on. This means this weapon could be a 360 degree off boresight weapon as it can manouver to acquire its target after launch and uses a datalink to ensure no own goals of course. This missile is supposed to be an all service missile to be used in the space and air defence forces Vityaz system and the Airforces Vityaz system and of course the navys Redut system as a sort of SEA RAM replacement for the missiles of Kashtan. The missiles of Kashtan of course don't need replacing on performance issues, but the Kashtan mount is not stealthy so for new stealthy vessels will use Morfei as a vertical launch Kashtan missile that is stealthy. Vympel is part of the Tactical Missiles Corporation (KTRV), while Fakel is part of Almaz-Antey, which is designing Vityaz. I think A-A might have a slight bias toward their "own" missile, rather than their competitor's, but, again, both projects seem to be pretty stale at this point. Certainly the first "version" of what we now call Vityaz I read about was an air breathing ramjet powered R-77 on a ground launcher, but Almaz-Antey seem to have trumped that with its two small S-400 missiles. I rather suspect that the Ramjet powered R-77 might survive especially if they can perfect a scramjet engine for it and give it significant range without making it too big based on the success of Meteor it should be interesting. The 9M100 has to succeed because R-73 or RVV-MD simply can't be used on the PAK-FA as an internal weapon because both missiles require a lock on a target before they can be launched. Short of slapping an IIR seeker on an R-77 and using its INS and datalink as a simple lock on after launch system there is little real alternative for a short range dogfight missile for the new Russian 5th gen fighter. Would be embarrassing if they can't manage an equivalent to the ASRAAM/AIM-9X/IRIS-T. But at the same time if they do get the 9M100 right and put it in their planes, land based medium SAM, and naval CIWS then they will have achieved something the west always harps on about but never gets right... the F-4 perhaps, but even with missiles the Navys ESSM is based on the older Sparrow rather than the newer Air force AMRAAM. Pretty much... though including it down to Corvette level makes it into a net centric system for the Navy. The addition of carriers with aircraft able to greatly extend reach and sight the Russian Navy will actually likely be rather more powerful than it ever was though smaller. I agree the 20380/81/85 are very capable corvette with the firepower of top NATO frigate , but it is ideal for coastal and brown water and not in openocean , that role will be taken by Frigate 20350/51. Sigma-3 is certainly very interesting , it gives ships from Corvette to Aircraft carrier to seamlessly talk and connect to each other and sensor fuse the data to present a single picture , its effective against stealth target or even ships that dont have power radar but powerful weapon that can use data from other ships. Its similar to US Navy Co-operative Engagement Capability and part of netcentric system. In time of war you use what you have. 99% of the time this will be a coastal corvette doing normal things, but like Georgia showed you don't always have time to move your best equipment to the backwater areas it is needed... if push came to shove this little vessel is quite capable of punching above its weight class. Yes I would agree with that argument , in the end in a war you would really want every ship to pack maximum punch , they are planning to build 35 corvette so thats really good numbers. Read up on the Warship Technology: Russian Naval Programs that I posted on Russia Navy Status its a nice brief plus it has a article on 20380 corvette program. there is a new 10 thousand ton destroyer under development so thats really a capable ship. Indeed and the unification of sensors and weapons plus the Sigma data sharing system means that some small stealthy vessels that have a full picture of what is happening on, under and above the sea might be very useful while remaining radar and electronically silent itself. An incoming Sunburn, or the signature of the specific radar used to guide sunburns told you you were facing a Sovremmeny Class Destroyer... now it could be anything. By unifying the launchers and making the ships multirole so instead of 10 fast missile attack vessels armed with Yakhont or Brahmos, 10 Torpedo vessels with torpedoes, and 15 cheaper gun/fast attach boats with a 76.2mm automatic gun and Uran subsonic anti ship boats they can instead build 35 boats of one type and when they need a group of fast attack boats and torpedo boats they can load up Clubs and Brahmos missiles for the missile vessels and the ASROC type Club missiles for the torpedo boats and they all have 100mm automatic guns. With the experience of the smaller vessels they can start on larger projects with some confidence that the systems and weapons work on a smaller scale. A 10K ton Destroy could have dozens of USUK launchers and Redut AD launchers... with corvettes carrying 100mm guns I wonder if the Destroyer will have one of the new 152mm guns they are working on (related to the Armys Coalition). Why is Steregushy class ship called corvette, when it is larger and better armed than Gepard class frigate? Buyan class is corvette and is far smaller than Steregushy. medo wrote: Why is Steregushy class ship called corvette, when it is larger and better armed than Gepard class frigate? Buyan class is corvette and is far smaller than Steregushy. Generally corvettes are classified as class ships with displacement between 1000 to 3000 tons ,its also depends on individual countries on how they would like to classify it. Different countries and different navies have different classifications, but a Corvette is basically larger than a small patrol craft but smaller than a Frigate. In many ways some large Corvettes could easily be called Frigates and some small Frigates called Corvettes. Gepard class (Dagestan) and Steregushy class are both in Russian navy, Steregushy in Baltic sea, Gepard in Caspian sea. Both are around 100 m long and around the same weight. Steregushy is called corvette and Gepard is called frigate. Maybe it depend on fleet or Sea in which they operate. Maybe it depend on fleet or Sea in which they operate. The Buyan is specially designed for brown water operations able to operate in shallow waters in rivers and lakes and coastal areas. The Gepard and Steregushy class are more for coastal patrol, but of course in the Caspian a Gepard has more of a leadership role and so is promoted to Frigate... which is very much a general purpose ship. In many ways Corvettes and Frigates are just fancy names for big naval patrol vessels... Frigates normally have helicopters, which Corvettes normally don't have which tends to make Frigates a bit more flexible and useful for patrol duties. Russian Navy signed a contract with "Fazotron-NIIR" to create a radar station for ships of class "corvette." Now experts "Fazotron-NIIR" are working on the development of radar. The company receives funding from the Defense Ministry. The first sample of the new ship's radar (SAR) will be presented in 2011, Interfax reported. General Designer "Fazotron-NIIR" did not disclose the number of the project nor what ships will receive new radar system. It's presumed it will be Project 20380 corvettes. The new radar is possibly the one shown below. The pictures are from a recent exhibition and the system is reportedly called "Integral" and is a development of the Zhuk-A radar for the Mig-35. Photos of that system have been posted here before... either by Austin or Medo. They look like a very interesting combination. The Russian navy is starting to streamline its systems and equipment, so it will be interesting what they do regarding sensors. Previously each weapon system had its own separate sensor suite which resulted in Soviet ships looking very cluttered, whereas western ships tended to use a radar for multiple purposes and often looked empty in comparison. It will be interesting to see if this radar/optronic system is a separate system mounted high on a mast for a good 360 degree view that supplies data to the onboard C4IR system, or whether it is perhaps to replace some radars used for certain systems. An example would be the Laska radar directors used on small ships that could control 1 or more gun positions from 30mm CIWS gatling guns through 57mm, 76.2mm and 100mm and even 130mm gun turrets. In comparison on a western vessel the 20mm Phalanx would have its own dedicated radar while the other guns might use data from the main surface search radar on the ship. Such a radar/optronic system on a small vessel could control several 30mm gun turrets or a Pantsir-S1 system with its radar and optronics removed to make it more stealthy perhaps. Will be interesting to see where they put it and whether it effects the sensors provided for other weapons. It might just be for general surveillance to look out for small pirate speed boats and to look at distant targets optically for the purposes of ID. ST. PETERSBURG, October 14 (RIA Novosti) - St. Petersburg's Severnaya Verf shipyard will deliver a new stealth corvette to the Russian Navy at an official ceremony on Friday. The Soobrazitelny is the second Project 20380 or Steregushchy class corvette designed by the Almaz Central Marine Design Bureau. “The corvette features innovative solutions regarding hull design, armament, communications and electronics,” the shipyard said in a statement. The first Project 20380 corvette, the Steregushchy, was put into service with Russia's Baltic Fleet in October 2008, and two other ships of the same series, the Boyky and the Stoyky, are under construction. The Steregushchy class corvette can be deployed to destroy enemy surface ships, submarines and aircraft, and to provide artillery support for beach landings. Advanced stealth technology is used to reduce the ship's secondary radar field, as well as its acoustic, infrared, magnetic and visual signatures. Russia plans to have up to 30 vessels of this class to ensure the protection of its coastal waters, as well as its oil and gas transportation routes, especially in the Black and the Baltic seas. Each corvette has a displacement of 2,000 metric tons, maximum speed of 27 knots, and a crew of 100. The ship's armament includes SS-N-25 Switchblade anti-ship cruise missiles, a 100-mm gun, a variety of air defense and anti-submarine systems, and a Ka-27 Helix ASW helicopter.